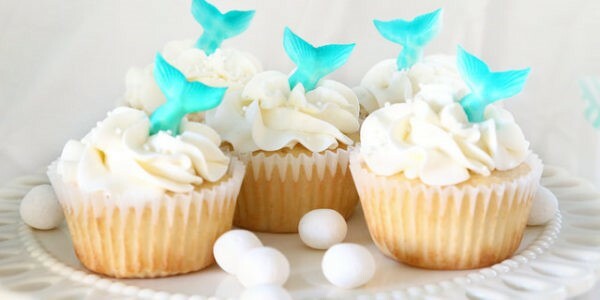 Are you a bride or bridesmaid trying to create the perfect bridal shower with a mermaid twist? Is planning everything from venue to pre-wedding parties making your head swim? 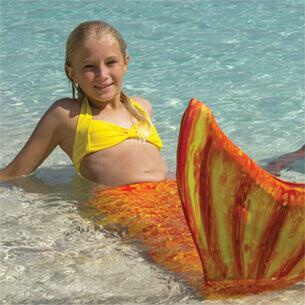 If so, we’re going to lend a fin and offer up some ideas for a magical mermaid-themed bridal shower! You’ve picked a date, you’ve created a guest list, and you have a theme –now what? 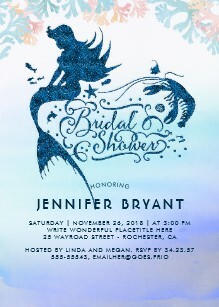 Design the invitations, of course! Online sites like Zazzle have a ton of options in different colors and styles. 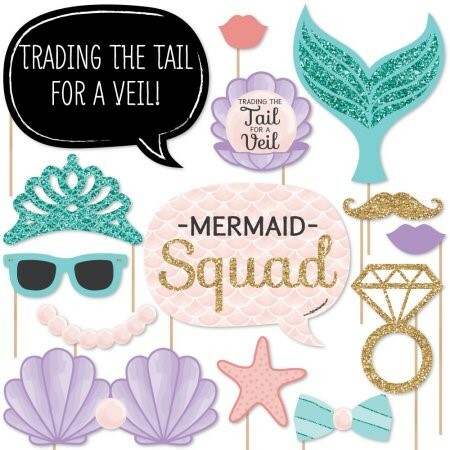 Another key element of a bridal shower is the decorations, ranging from mermaid motifs mingled with beachy décor to a party fit for Ariel herself! If the goal of the day is for the bride-to-be to feel like she’s a Disney princess, incorporating shades of blue, green, and purple with sparkling accents is a fin-tastic way to pay tribute to The Little Mermaid movie musical. 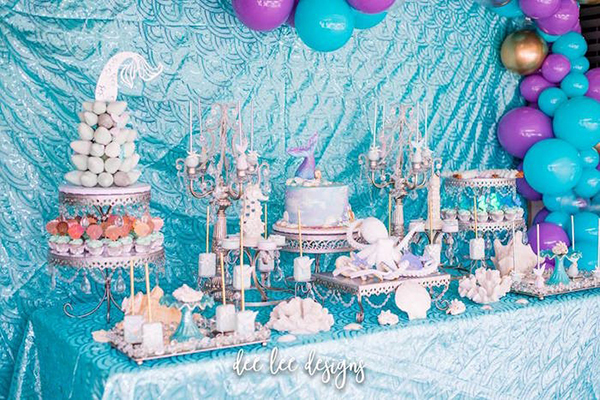 Spotlighted on Kara’s Party Ideas, this mermaid bridal shower captured the Disney spirit with bright colors, aquatic décor, and balloons for under-the-sea vibes. 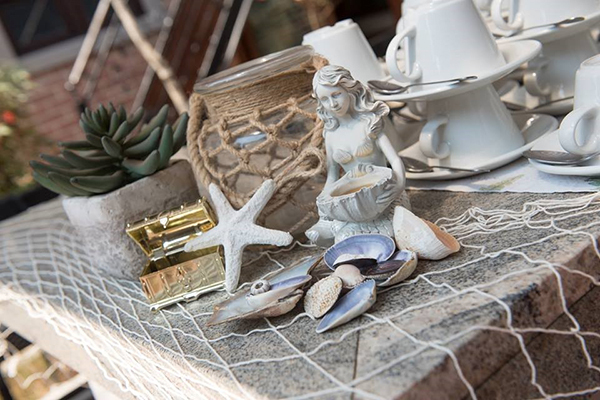 However, if the future Mrs. prefers more subtle details or a vintage-inspired look, using items like netting, seashells, and other beachy trinkets might be the way to go. Plan Me Pretty put together this oceanic ensemble, and a scroll through the blog shows how a more natural mermaid theme can be combined with a dazzling watercolor touch. Another critical question is how do you make the event fun for both bride and guests? When it comes to entertainment, games are a great place to start. 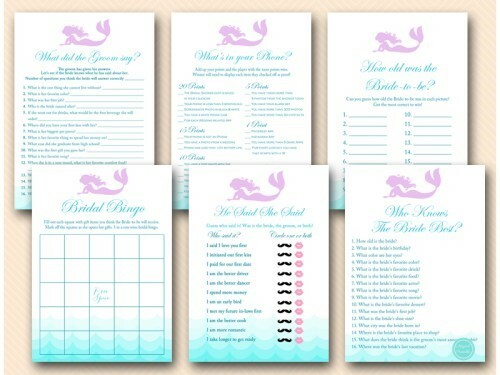 Magical Printable offers this adorable set of Mermaid Bridal Shower Games for only $10, complete with some ocean waves on the bottom and a mermaid on the top. 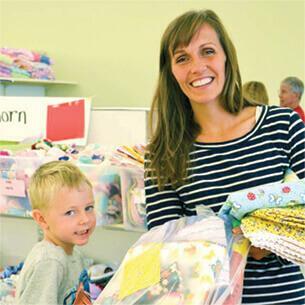 For those who aren’t big on games, a craft could make a fun alternative. 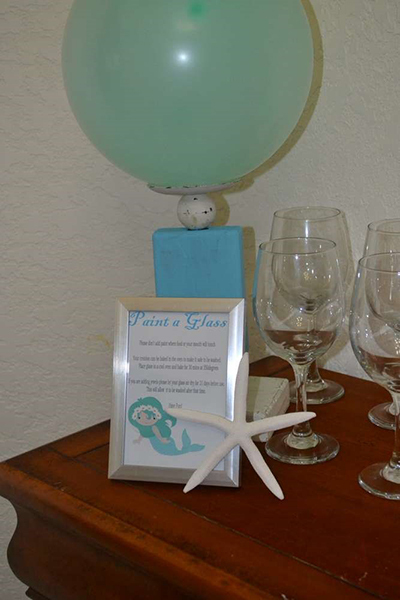 Catch My Party user Amy T. had the great idea to have a “Paint A Glass” station at her mermaid bridal shower, allowing everyone to unleash waves of creativity. 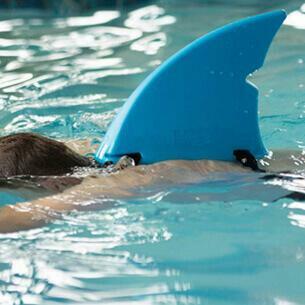 After games have been played and crafts have been made, give your fins a rest with a photo booth! Grab a camera or phone and some props, then have fun taking pictures that can later be printed as a keepsake for the bride-to-be. This Mermaid Photo Booth Props Kit from Walmart will let guests have a whale of a time snapping goofy photos of each other. No party would be complete without something to nibble on! 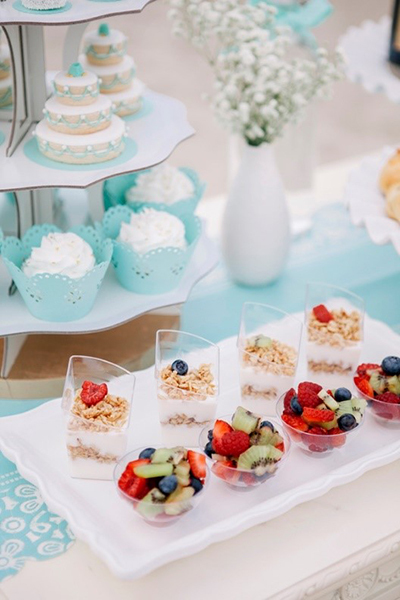 While you want to save the gourmet meal for the actual wedding, providing some light dishes and desserts are a surefire way to keep your mermaid pod happy. The site Everything Mermaid offers some cute and tasty ideas for treats to satisfy your sweet tooth! While sweets will always be a hit at social gatherings, bowls of fruit or yogurt parfait are some healthier crowd-pleasers for those watching their mermaid figure. Check out Something Turquoise to see a beautiful snack-table set up! Make sure you have something to commemorate this special occasion. 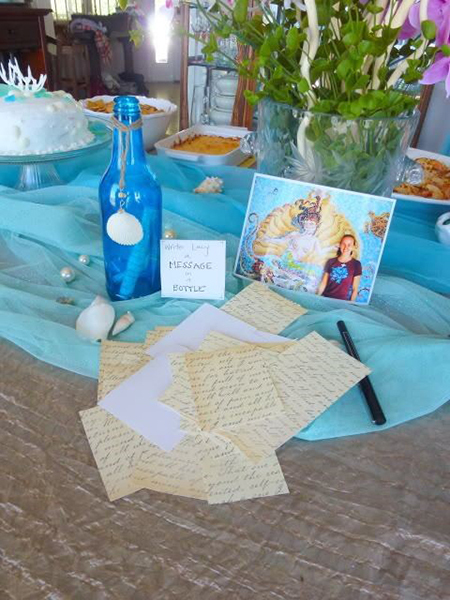 At the end of the day, this party was for the bride-to-be, so what better way to honor her than by writing notes and advice to create her own message(s) in a bottle? The Happy Wonderer features this sweet idea as a keepsake for the soon-to-be bride to treasure forever. Naturally, you should also give guests a small token of appreciation for being a part of this special day. 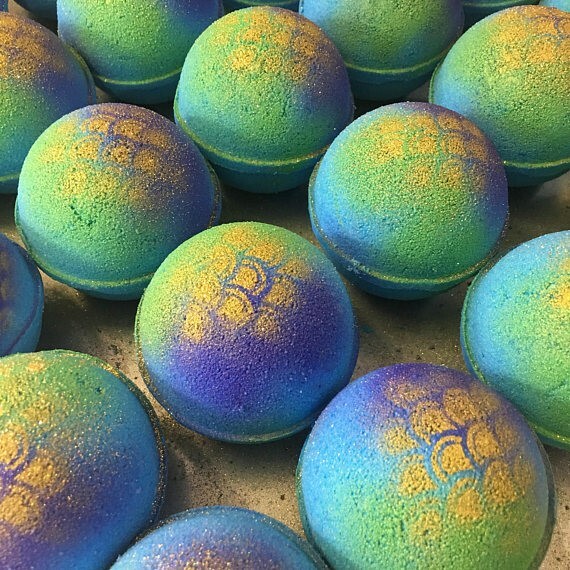 Seaworthy options include favors like flip flops, nail polish, or even mermaid bath bombs! Etsy and other online markets have limitless possibilities for finding the perfect little something to give guests as they leave. 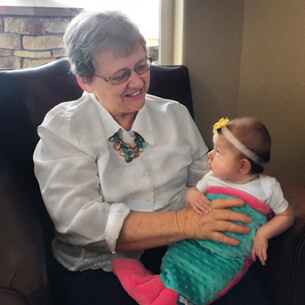 Feeling some finspiration? Let us know if you have any suggestions for hosting a bridal shower for someone who’s trading a tail for a veil! Email social@finfun.com or comment below!